Green beans are so often an afterthought, seemingly included only to add a bit of green to a plate dominated by protein and potatoes. 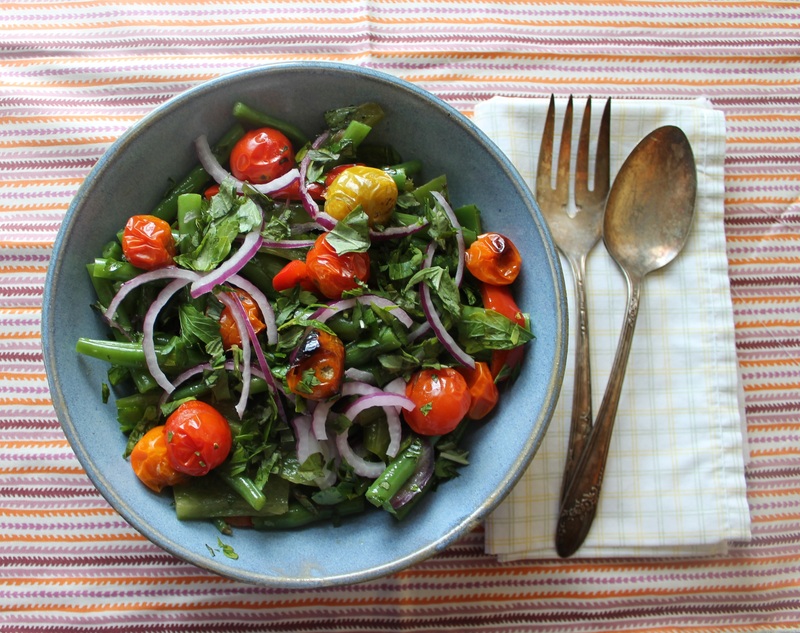 Not so here: the natural sweetness of green beans plays off the acidity of the dressing, the smokiness of the roasted tomatoes, and an extra kick from the raw red onions to make this a salad second to no main. 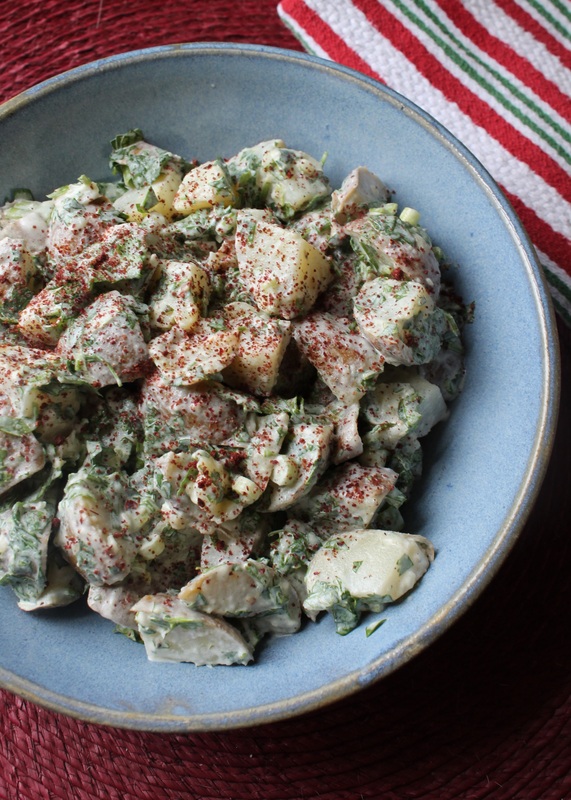 Serve it with grilled lamb and tkemali plum sauce, Trout with cilantro-walnut sauce, or alongside Ajaran khachapuri. 1.5 lbs. green beans, trimmed and cut into 2-in. pieces. 1. Arrange a rack in the top slot of the oven and preheat the broiler. Bring a pot of salted water to a boil on the stove. Boil the green beans until crisp-tender, about 5-7 minutes. Drain in a colander and run the green beans under cold water or place them in an ice bath to stop the cooking. 2. Heat the oil for frying in a saute pan. Add the onions and peppers and cook, stirring occasionally, under crisp tender, about 8 minutes. Add the garlic and cook 30 seconds more, until very fragrant. Remove from heat. 3. Line a baking sheet with foil and place the tomatoes on it. Broil about 5 minutes, turning once, until the tomatoes blister and begin to fall. 4. Make the dressing: whisk the olive oil, lemon juice, pomegranate molasses, salt, pepper, and red pepper flakes together in a small bowl. 5. Mix the green beans, onions and peppers together in a medium bowl. Add the dressing and stir to combine. Top with roasted cherry tomatoes, fresh cilantro, and very thin slices of raw red onion. I still love that familiar version, but at home I like something with a little more kick to it. This Georgian version is a creation of my own kitchen rather than an adaptation of a traditional Georgian dish (though it wouldn’t be out of place there). I prefer to keep the skins on the potatoes for the flavor they add, but you can peel the potatoes after you boil them if you like. Experiment with different combinations of herbs. For the most authentically Georgian flavor, seek out the glossy purple “opal” basil, which is sharper and clovier than the green Genovese basil most commonly found in the US. This salad can easily be made a day ahead of time and stored in the fridge overnight. 1. In a pot, cover the potatoes with an inch or two of cold water and add a teaspoon of salt. Bring to a boil, then reduce heat and simmer until the potatoes are tender all the way through, around 10-15 minutes. Drain and rinse several times under cool water to stop the cooking. Chop the potatoes into bite-size chunks and transfer them to a mixing bowl. 2. Add the mayonnaise, ½ tsp. salt, black and red pepper, vinegar, scallions, and herbs. Mix well. Adjust seasonings to taste. 3. You can chill the salad at this point if you are making it in advance or prefer to serve it cold. Otherwise, transfer it to a serving dish and sprinkle ground sumac over the top if desired.